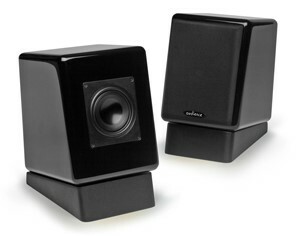 San Marcos, CA, March 26, 2013 – Audience today announced that it is now shipping its ClairAudient The ONE single-driver loudspeaker. The smallest model in Audience’s ClairAudient speaker lineup at just 7 inches high by 5.5 inches wide by 7 inches deep, the ONE is ideal for desktop music listening, compact high-end stereo systems and surround sound home theater. The ONE incorporates the same exclusive A3-S full-range crossover-less driver as every Audience ClairAudient loudspeaker, along with a purpose-designed passive radiator. The A3-S is a full-range high power, 12mm excursion, ultra-low distortion transducer. It eliminates the need for a separate woofer, midrange driver, tweeter and crossover network – and their inherent sonic compromises of sonically dissimilar drivers, phase distortions, loss of resolution and transient response degradation. Available in a choice of stunning high-gloss finishes including black, red, white and blue with black grilles that attach magnetically to the speaker, The ONE is a true point source loudspeaker that offers a seamless, absolutely coherent sonic presentation at all frequencies with extraordinarily precise imaging and remarkable soundstage realism. “Even off axis, The ONE is uncanny in its ability to sound more like live music and less like what we’re accustomed to hearing from a stereo system,” McDonald noted. Because it has no crossover, The ONE is direct-coupled to the amplifier it’s connected to, enabling the full damping factor of the amplifier to be directly applied to the A3-S driver’s voice coil. By allowing the amplifier, speaker cable and driver to act as a single coherent system, a level of control over the driver is achieved that is not possible with any speaker with a crossover. The ClairAudient The ONE employs the highest-quality parts throughout including low-mass binding posts and Audience Ohno (monocrystal) Auric internal wiring. The ONE presents a benign load to an amplifier, resulting in compatibility with a wide range of tube and solid-state amplifiers. The ONE is flat from 50Hz to 20kHz in-room response when placed on a desk or near a wall; a subwoofer is required for full-frequency response when The ONE is situated away from a wall. The Audience ClairAudient The ONE loudspeaker is now available at a suggested retail price of $995 per pair in black and blue finishes; white and red finishes will be available soon (to be announced). Posted in Announcements, Loudspeakers, Press Releases, The ONE and tagged Audience loudspeakers, buy, the ONE.